First we have to do interviews, next we are posing for photos. I think my company is turning us into wannabe celebrities in China. Last week our campuses marketing guy came up to me and asked me in broken English “I want to take photo of you.” Rather surprised, I asked him why. He replies “For the website”. So apparently the company is taking photos of all the teacher and putting them on their website. So I took one normal one, thinking that was done. But no, he said “you have to do different photo”. I asked how could I do a different photo? He shows me his phone of MODELS doing different poses; twiddling their hair, hands on the hips… you know, model poses. So I attempted to try a model pose. It is hard! First of all, I don’t think I am photogenic whatsoever. You know, some people just take good photos, whereas I don’t. Well I think I don’t anyway. But I gave it a go. 1. I am not a natural poser. I just don’t like posing in photos. I like to take a quick simple one and then it’s done. No messing with getting a pose right or tilting the head. I don’t like getting photos taken of me. 2. It’s hard! All the celebrities make it look so easy and natural. Me, I didn’t know what to do. Where do I put my hands? What about my head? Do I look at the camera? So much to think about! I ended up doing one messing with my hair (yes it probably looked like a messy photo too), and another one with my hand to my chin, trying to look cute yet mysterious, probably looking the opposite of what I hoped to achieve. I am imagining they may put these posed photos in some leaflets or some banners for the company. They have done that with other teachers. Their face plastered all around Chengdu. I hope they don’t pick me. The reason for my wanting of an e-bike is because I’m jealous that my boyfriend has bought one, and I want one. Because he lives and works at a different campus he thought it would be handy to buy one so he can both visit me and leave me home. He lives nearer the centre of Chengdu while I live 30 minutes by metro. My own bike is still out of service as I have been too busy to get it fixed, but when I do, I know It’ll be a disappointment. The weather is very hot at the moment, and I am not looking forward to cycling to work at all. Whereas with an e-bike, there will be no sweating and you get there faster. But I suppose I could always buy one in the future. 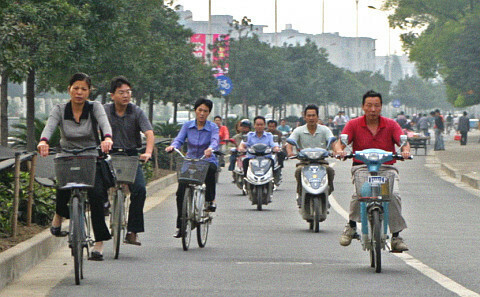 E-bikes are big businesses in China. Particularly in Chengdu, there are so many. Mainly due to the fact that most of Chengdu is pretty flat, it’s an ideal place to drive one. There are apparently 120 million e-bikes in China, and this number is increasing. There are a few different varieties of e-bikes that I have seen. There are quite small ones, usually used by older women with babies. They usually have a small seat at the back so the baby sits there. These are not used for going long distances. Another type is the one my boyfriend has. These are the nicer looking ones. These are (to me) Italian looking, and they are more like scooters. Many of the new ones have really cool designs on them. You can fit two people on these. The biggest types are used for going long distances. They are sturdier but they are also a lot bigger and heavier. You can fit two comfortable, but I often see two adults and a child on these. Usually families. Although e bikes are really handy, there are quite a lot of accidents. I personally have never seen any, but from what I see around me, there are many near misses. I know I’m not safe while cycling, but these e-bikes can go up to 60kph so they are pretty fast. And so many people don’t wear helmets. We are planning on buying them because, we would rather be safe than sorry. 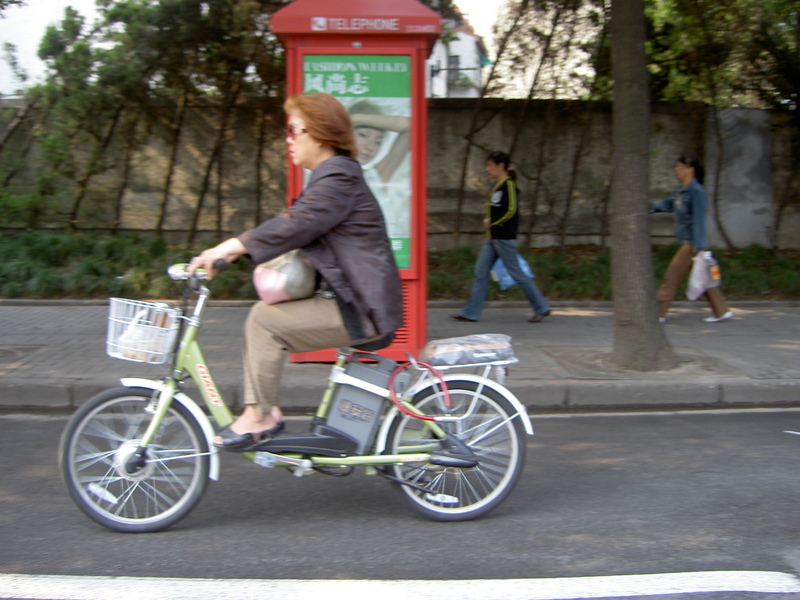 Also, China has a law stating that only one person is allowed to sit on an e-bike. I never knew this law actually existed. People ignore this rule completely, and the police don’t seem to care. Even if they did, the amount of people driving these things, they would never eradicate the problem. Usually roads are like this. So If plan on staying in China for another year, I might invest in one. They are pretty cheap to western standards. You can get second hand ones for 1300 Yuan, or 155 Euro. So cheap! I used to dread Mondays and Fridays. Those were the days when I had, what I liked to call them: Killer Babies. This was my group of two 4 year olds. One boy and one girl. Before the boy arrived, there used to be two girls. Sweet, quiet and they got along ok. But, the father of one child decided to take her out of class, and would re-enrol her again when he deemed her more confident. So after her, came one boy. When I first met him he was shy and quiet, holding onto his Mum for support. However this was an act; I would soon realise his true nature during class. So this class, every class, was terrible. The girl was shy and quiet, meaning I couldn’t get her to do anything with me and the little boy. One, she was afraid of him. Two, she wanted to play with girly things while he would rather throw a ball about and play with cars. Not a good start. Then the bullying started. Not bullying as such, more like the boy was becoming more and more disruptive in class and pushing the little girl about. The girl used to be cute and would play along with me, but now she would sit in the corner and cry, not wanting to go near the boy. When a class isn’t going very well, you think ‘Is it me? Am I just a bad teacher?….maybe I’m not cut out to teach children.’ Things run through your head and they generally do put you down. The majority of my classes go well. Just sometimes the students don’t gel with a teacher. I used to have one girl, 5 years old, and she just didn’t like me. I don’t know why. I’ve never done anything to upset her. But she just took a disliking to me for some reason. I was pretty happy when she got moved to another teacher. Of course it’s a little disappointing, but at the end of the day, there’s only so much you can do to teach students. If they don’t participate then you can’t completely blame yourself for having a bad class. Now I see her and she is a lot happier with her new teacher. A happy student means a happy parent. So anyway, something had to change with my Killer Babies. With my PA, (Chinese Personal Assistant for this group) we discussed what we could do to change the tension and atmosphere in the group. I suggested moving the boy to a 1-1 class. This is when it’s just one student and teacher. It was obvious he couldn’t work in a group. Although this means it’s more expensive because its 1-1. No such luck. The parents said no. They thought the only reason we were trying to get him into 1-1 was to get more money off them. This was the last thing we were thinking. Each group of mine; 1-1, up to 1-4 means I still get paid the same amount. He is better suited 1-1. But anyway, that was that. Fortunately we got the little girl moved into another 1-2 with a little boy she knew, so she was happy. However I still had the boy, and guess what, he got paired with ANOTHER girl. I done the demo for her and she was the sweetest wee thing, and clever for her age. I thought ‘well she is more active than the previous one, so hopefully they will get on better’. I was wrong. The second class in, the boy had her crying, and was driving me mad. I couldn’t teach them anything because both of them were doing completely different things. The things that set me off again was when the boy stood on the girls leg on purpose. I had to move them. It wasn’t fair on the little girl. 2 different pairings and none of them worked out. It was clear that the problem lay with the boy. I have nothing against him at all, he was very active and he repeated a lot of English, he just wasn’t suited to group classes. The PA had a discussion with his parents. So I check my new timetable and I see that that group is no longer there! I was ecstatic. I still have the little girl for the moment, and she is so much better now. She hasn’t cried, she plays with me, and its generally a good class. So everyone was happy. I certainly was! I no longer have to dread my Mondays and Fridays. And I made it clear to everyone at my campus…. I do NOT want babies. I have finally found my beloved bike! Although one of the tires is flat, and the chain is off the bike, I don’t mind, because I FOUND IT! I was beginning to get annoyed because It couldn’t be found anywhere. But I spotted a notice with the number 35, 34, 17 and 26 on it. Because my friends one was in block 35, I was presuming the notice was related to my missing bike. So I decided, after work, to have another nosey down in block 34. I checked there a week ago with no bikes to be seen, so I had little hope. However I was surprised to see loads of them there, with mine tucked beside a wall. I was so happy! So these past few weeks have been rather eventful; both with work and personally. I have finally visited the famous pizza place in Chengdu called Mikes Pizza. I have heard so much about it but I’ve never visited before. I have to say it is really nice. Really authentic pizza. I’ve also been invited to attend a Chinese wedding. It’s on at the end of August so I have plenty of time to pick out a dress to wear. It’ll be difficult though. I have no idea what people wear to Chinese weddings. Also, what I deem formal wear, ISN’T formal here, they would wear it on a regular day. So I will have to choose carefully. However this week, I was LATE for work. I was supposed to have class at 10:30am. I woke up at 10:33am. I thought ‘OH S**T’. So I quickly rang in and told them I would be late. I arrived in half an hour LATER to class. Oh and I’m also plagued with mosquitos. I never realised how bad they are in China. Although you can’t catch malaria or the sorts (I’m led to believe) they are annoying buggers, waking up with 4-6 bites ever second day. And my students literally run away from them in class. My bike has disappeared. I was pretty shocked to see that it wasn’t where I left it. I was even more surprised to see that every bike and e-bike that are usually parked beside mine were also gone. All of them. Not one left. Puzzling though, the bikes left inside the complex were also gone. So I had a wander around the building, no luck. I was thinking ‘some b*****d stole all the bikes and put them on a truck’. That actually has happened to one person I know. So I contacted my fellow colleague and sure enough I get a response saying ‘yeah mine was gone also, they have been moved underground to block 35′. Apparently there is a sign saying that we are not supposed to park our bikes there. Now this sign is in Chinese, so I was not aware I was breaking the law. But there you go, after being here for 5 months, they finally decided to enforce it. So I have a gander down to block 35… the bicycle graveyard it seems. There were around 60 bikes crammed together. The ones at the back of the room were full of dust so they have been laying idle for a while it seemed. But alas, my bike wasn’t there. Apparently they have put the bikes according to building. So my one is with everyone elses from my building. The only problem is I don’t know WHERE they put them. So I gave my number to the man who takes care of the bikes (he actually sleeps in block 35, I saw his bed) and he said he will ring when he knows where my bike is located. God knows how that will work out, it was obvious he knew no English. So I have to either get the bus or a tuck tuck to work for the foreseeable future. 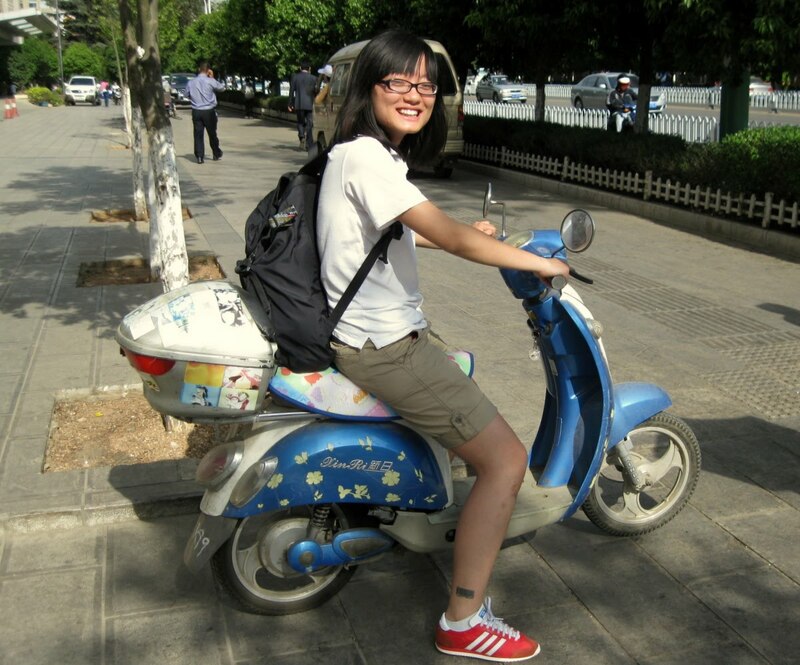 I really miss the bike though, I realise how much I need it. But I have to laugh. Only in China would they move your bike without telling you. Oh you still amaze me.